Our Brake Bleeder Screws meet SAE specifications for quality, safety and performance. All Brake Bleeder Valve Fittings products are produced to ISO-9002 certified standards to ensure consistency in every product produced as well as complete traceability essential in maintaining our high quality standards. 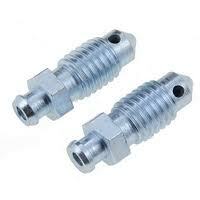 Break Caliper Bleeder Replacement Bolts come in many screw sizes, Please check our referece chart for more information .